FLORIDA - Tropical Storm Irma has made an appearance and residents of the Caribbean are being advised to track its progress because it could potentially threaten some islands next week. 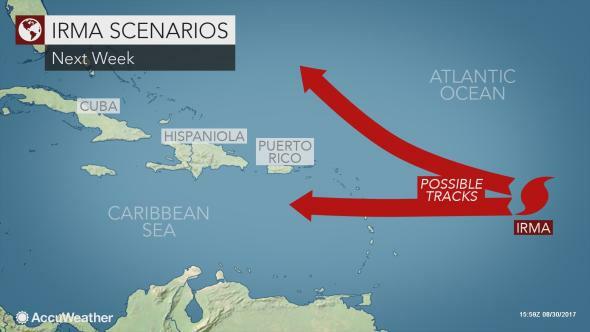 Earlier this week, the National Hurricane Centre (NHC) in Miami said potential tropical cyclone number 10 which was located off the southeast US coast had the potential to become the next named storm of the Atlantic hurricane season. 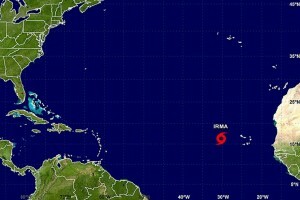 But it was a tropical wave off the Cabo Verde Islands at that time that has developed into Irma. The NHC said in its 11 a.m. advisory that Irma had formed over the far eastern Atlantic, but it posed no immediate threat. It was about 420 miles west of the Cabo Verde Islands and moving toward the west near 13 miles per hour at the time. According to the NHC, that general motion is expected to continue for the next couple of days, along with some strengthening, and Irma, currently carrying maximum sustained winds near 50 miles per hour, could become a hurricane by Friday. Forecasters say Irma will take about a week for the system to make its trek westward across the Atlantic Ocean, but interests in the Eastern Caribbean should monitor its progress, especially next week. “Steering winds will guide Irma close to the Leeward Islands and then perhaps Puerto Rico and Hispaniola around the middle of next week,” said AccuWeather Meteorologist Brian Thompson. “At the very least, there will be an increase in surf in the northeastern Caribbean early next week,” he added.